On the lookout for a tasty, quick and easy snack that is good for you? You can even turn chickpeas, (also called garbanzo beans), into a appetizing treat! A bowl of these are perfect when having friends over for happy hour or a potluck. 2) Toss the chickpeas, oil, cumin, garlic salt, chili powder and black pepper in a large bowl until well coated and uniform. Pour into a large, lipped baking sheet and spread into one layer. 3) Bake until browned and crisp, stirring occasionally, 45 to 60 minutes. Set the baking sheet on a wire rack and cool for 10 minutes. 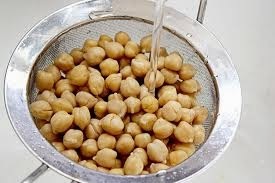 Use a slotted spoon to transfer the chickpeas to a serving bowl. Serve warm or at room temperature with plenty of napkins. This recipe is from the book, “Blue Zones Solution, Eating and Living Like the World’s Healthiest People” by Dan Buettner. For more information about Blue Zones, check out www.bluezones.com.